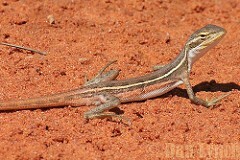 The Cane-grass Dragon (Diporiphora winneckei) is a small, terrestrial, diurnal (active during the day) lizard endemic to Australia. It is found in throughout arid zones of Australia and is also a common house pet. It is a grey or pale brown to reddish-brown colour, with a thick grey ventral band that runs from the nape to the tail. It also has creamy-yellow (female) or silver grey (male) stripes that run down each side of its back, converging at the pelvis. Dark angular blotches lie between the stripe and the ventral band of female, while males have fewer or no blotches visible. The dragon is usually found on desert sand ridges or other sandy soils in amongst ground litter, cane grass, spinifex or hummock grasses. The dragon is rarely sighted, despite not being rare, due to its excellent camouflage and secretive behavior. Although the Cane-grass Dragon is not currently listed as a conservation concern, it is still subject to those threats that threaten all Australian reptiles. These threats include introduced diseases, death on roads, habitat modification, degradation and loss and feral predators such as foxes, dogs, cats and even cane toads. Cane-grass Dragons feed during the days and are insectivorous. However they have been found on some occasions to consume leafy greens and flowers. The Cane-grass Dragons is a slim lizard with a long tail and limbs, approximately 15 to 24cm in length. Feral predators such as foxes, dogs, cats. Cane-grass dragons reach sexual maturity at around one year old. During the breeding season, the male will attract a female by repeated head bobs, which displays his willingness to mate. If the female is not ready she will run away, however if she is, she will lower her head several times to show she is interested. The breeding season for the dragons is from October to April and in that time the female can lay between four and six clutches. After fertilization, the eggs will develop in approximately two to three weeks. The dragons are oviparous, and will lay between one to three eggs per clutch in a small nest in moist sandy soil.